...that over a million Guardians were active around the time of the Taken War? ...that Io is the last place touched by the Light in the Solar System? "It is time to avenge my fallen brothers and sisters. Stand with me, Guardian. Prove yourself worthy, and the Iron Lords will rise again!" Rise of Iron is the fourth and final expansion for Destiny, and was released on September 20, 2016. The story follows Lord Saladin, a former Iron Lord as he gathers a new generation of Iron Lords to defeat the Fallen Devil Splicers who have recently rediscovered a Golden Age self-regenerating nano-technology called SIVA, and are using it to transform themselves into cyborgs. The expansion takes place on Earth in a walled off area of the Cosmodrome known as the Plaguelands. This expansion was released one year after The Taken King. Guardians must rise to the challenge to take their place as the next generation of Iron Lords. Along the way they will join forces with a legend from humanity's Early City Age to defeat a plague of unstoppable evil once and for all. King of the Mountain - The first story mission. You have been asked to defend a former mountaintop observatory atop Felwinter Peak. Completing this mission unlocks the Felwinter Peak social space. The Walls Come Down - Players are tasked with going into the Plaguelands to find the source of the SIVA corruption. The Plaguelands - Players must go into the Plaguelands and take out turrets that are being controlled by the Devil Splicers. Download Complete - Players travel to Mars to try and find references to SIVA in Clovis Bray archives. The Iron Tomb - The final mission has players go down into the Replication complex and destroy SIVA at the source. Bad Blood - Players must investigate a Hive uprising in the Plaguelands. Beauty in Destruction - This is a Quest to receive the Exotic Gjallarhorn Rocket Launcher. A Khvostov Rising - This is a Quest for the Exotic Khvostov 7G-0X. A Symbol of Honor - The first step in the Beauty in Destruction Quest. Show of Strength - PlayStation exclusive Quest that rewards the legendary ship Timeless Tereshkova. The Plaguelands - A winterized, SIVA-infested section of the Cosmodrome filled with Devil Splicers and some occasional Hive clusters. Iron Temple - An ancient temple atop Felwinter Peak that was once home to the Iron Lords. It is unlocked by completing the story mission King of The Mountain. Astrocyte Verse - Exotic helmet. Signature perk grants temporary increase to recovery while Blinking. Dunemarchers - Exotic Titan boots. Signature perk allows the wearer to increase sprint speed, movement speed whilst aiming down sights and a tighter turn radius while sprinting. Fr0st-EE5 - Exotic Hunter boots. Signature perk allows the wearer to regenerate abilities whilst sprinting. Ophidian Aspect- Exotic Warlock gloves. Signature perk features improved energy drain, with all weapons ready and reloading very quickly. Shinobu's Vow- Exotic Hunter gloves. Signature perk grants an extra Skip Grenade charge on Bladedancer. Thagomizers- Exotic Titan gloves. Grants extra melee charge and unlocks Striker subclass node Amplify for free. Transversive Steps- Exotic Warlock boots. Signature perk grants faster movement speed while crouching and picking up ammo automatically reloads the weapon matching that ammo's type. Khvostov 7G-0X - Heavily customizable Auto Rifle that has 3 modes of fire and two different firing rates. The signature perk grants additional stability, although some could argue that the signature perk is that it has over 100 different customization options. Outbreak Prime - Pulse Rifle acquired via a quest from the new Wrath of The Machine raid. The Young Wolf's Howl - Sword acquired by completing all Rise of Iron Story Missions. Trespasser - Sidearm that drops from either Exotic Engrams or from Xûr on the weekends. Year 3 Thorn - Hand Cannon acquired from the quest A Light In The Dark. Year 3 Gjallarhorn - Rocket Launcher acquired from the Quest, Beauty in Destruction. Wrath of the Machine - Kill the commander of the Devil Splicers in his Perfection Complex. The Wretched Eye - Infiltrate old missile silos and kill a Splicer Priest who's experimenting on Hive. The Devils' Lair (Sepiks Perfected)- The Devil Splicers have invaded the Hellmouth. Kill them and any Splicers in the way. 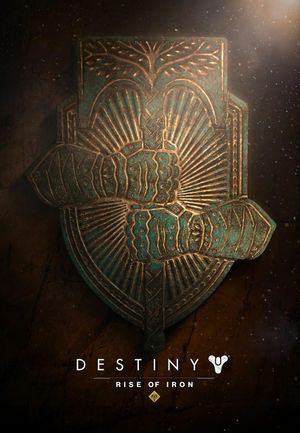 Supremacy - Similar to Call of Duty's "Kill Confirmed mode, Guardians must collect crests and the opposing Guardians honor. Floating Gardens - Crucible map on Venus. Skyline - Crucible map on Mars. The Last Exit - Crucible map on Venus. Archon's Forge - A new cooperative Arena. Devil Splicers- Fallen that have been upgraded with SIVA nano--technology. A new customization option known as Ornaments for select weapons and armor. Acquired from the Wrath of The Machine raid, weekly treasure boxes, and Eververse. The Iron Gjallarhorn was included with all pre-orders of Rise of Iron. The Iron Gjallarhorn itself was not immediately made available, and has to be unlocked by completing a quest. Content was made available to all players after January 1, 2017. The Iron Gjallarwing Sparrow was included with all pre-orders of Rise of Iron. Content was made available to all players after January 1, 2017. The trademark for Rise of Iron was registered on May 31, 2016. The existence of Rise of Iron was revealed in a leaked photograph of a promotional poster for the expansion. The poster showed Lord Saladin, the Tower envoy for the Iron Banner, surrounded by wolves and holding a fiery battleaxe before a breach in the Cosmodrome's wall. Prior to this, Activision had stated that Bungie was at work on a "new large expansion" for Destiny that would be delivered by the end of 2016, but provided no further details. Rise of Iron was the last major content update for Destiny before the 2017 release of its sequel, Destiny 2. The expansion's art direction was based entirely on Saladin himself. It also used Game of Thrones as an inspiration for its character dynamic. The same dog that provided motion-capture for Ghost was used in the game's development. It was intended that the expansion present the Destiny universe as a living place, hence the return to Old Russia, showing the detritus of earlier battles. Rise of Iron is the first Destiny expansion to not be released on the Xbox 360 and PlayStation 3; it is only available on Xbox One and PlayStation 4. Players can transfer their characters to the newer generation of consoles, but will not be able to transfer their characters to the previous generation, as Rise of Iron content will be incompatible. Updates and hotfixes for Destiny on previous-generation consoles have also been discontinued. ↑ IGN: Rumored Destiny Expansion: Bungie Trademarks "Rise of Iron"
Bold italics indicate games. Italic text indicates expansions and content updates.